The last few months of the year typically bring good tidings for consumption-driven companies as a rise in demand due to festivals boosts their bottom lines. The last five months of the year bring good tidings for consumption-driven companies as the rise in demand due to festivals boosts bottom lines. The BSE Sensex, the FMCG index, the Consumer Durables index and the Auto index have given average returns of 12.28 per cent, 10.68 per cent, 20.79 per cent and 15.03 per cent, respectively, in the August-December period of the last 10 years. Since its launch in 2006, the CNX Consumption index has given an average return of 5 per cent during the period. The index reflects sectors that benefit from consumption, such as consumer durables and nondurables, health care, auto, telecom and pharmaceutical. But will this year be different? According to Fitch data, India's consumer spending in August was the weakest in seven years. But many are calling this a blip. "A revived monsoon should improve sentiment by keeping inflation from soaring out of control. Consumption spending should increase in the third quarter of 2012-13. This should boost the prospects of farm moving consumer goods (FMCG), retail and car companies," says Sandeep Nayak, executive director and chief executive officer, Centrum Broking. Mohit Modi, director, equity research, Crisil Research, says, "Consumer sales pick up during the festive months. While we expect stock markets to give better monthly returns this season too, deteriorating macroeconomic environment and erratic monsoon are likely to keep the returns relatively lower." Considered safe during market downturns, the sector includes businesses related to food, health food & supplements, tobacco and oil, that are in demand even during periods of economic slowdown. 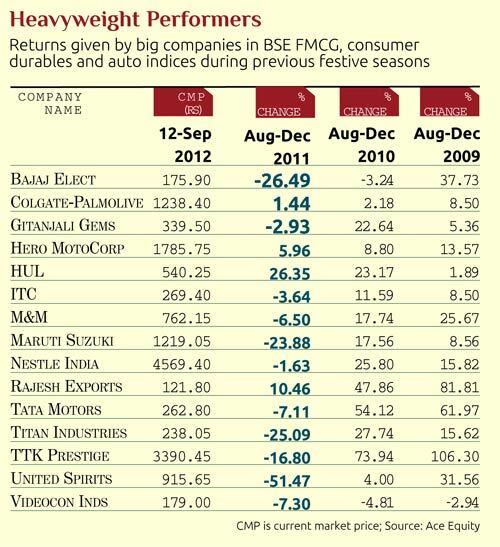 Between August 2011 and August 2012, the FMCG index beat other major indices by rising 34 per cent to 5,356. Milan Bavishi, head, research, Inventure Growth and Securities, says, "The rest of the year will be good for FMCG companies. One can take defensive bets on the sector as the festival season will improve sales." Experts say those looking for investment options can bet on Nestle India and Marico. Nestle, they say, is the best play in the packaged food category in India over the long run. During 2011-12, it registered an operating profit of Rs 1,546 crore, up 21 per cent from Rs 1,274 crore in 2010-11. The stock has risen 13 per cent to Rs 4,598 this year till September 6. According to an Edelweiss Institutional Equities report released in August 2012, volume growth will recover in the coming quarters due to the company's focus on new launches. However, rising input cost is a worry. The stock is trading at 39.7 times 2012 expected earnings and 32.7 times 2013 estimated earnings and looks fairly valued. It can touch Rs 4,900 in the next few quarters. Marico's diversified portfolio makes it a good pick. The company bought the personal care business of Paras Pharmaceutical in May 2012. This gave it youth brands such as Setwet, Zatak and Livon, which share top three positions in hair gel, male deodorant and hair serum categories, respectively. The company posted revenue of Rs 972 crore in the first quarter of 2012-13 as against Rs 804 crore in the corresponding quarter a year ago. A research report by Espirito Santo Securities in August says, "On account of increased revenue, we expect the stock to touch Rs 212 in the next few months." On 7 September, it was at Rs 202. The BSE Consumer Durable s index has risen 16.5 per cent to 6,237 this year till September 6. It includes Whirlpool of India, TTK Prestige, Titan Industries, Bajaj Electricals, Gitanjali Gems, Blue Star, Rajesh Exports and VIP Industries. Facing cost pressure for the last few quarters, most companies that make household appliances have increased prices in the last few months. This augurs well for their performance. According to industry experts, prices of refrigerators and washing machines rose 6-7 per cent year-on-year in the first quarter of 2012-13. Also, there was a 3-4 per cent increase in prices of CRT (cathode ray tube) televisions, although prices of panel TVs (LCD/LED) fell due to increase in supply. Bavishi of Inventure Growth and Securities says, "High raw material prices and inflation can hit the sector." DK Aggarwal, chairman and managing director, SMC Investments and Advisors, says Videocon Industries can give positive returns till December. Videocon's market capitalisation is over Rs 5,500 crore. The company is looking to sell its entire 10 per cent stake in an oil block in Mozambique to Royal Dutch Shell. The sale is expected to fetch $3-3.5 billion (Rs 16,500-19,250 crore) and help the company free itself from debt and bid for the lost spectrum. The company plans to exit mobile manufacturing and stick to its core consumer electronics business. "The stock can give positive returns till December 2012," says Aggarwal. On 6 September 2012, it was at Rs 173. The festive season is one of the peak periods for automobile sales. Due to lower running cost of diesel cars, customers are shifting away from petrol cars, with the result that car makers gave higher discounts in July to push sales. "We expect these discounts to continue during this festive season, which should help the companies offload inventory. We expect domestic car sales to grow 5-7 per cent in 2012-13 as against 2.2 per cent in 2011-12," says CRISIL's Modi. Between August 2011 and December 2011, the BSE Auto index slid 7.75 per cent due to weak market sentiment. This was, however, less than the Sensex's 15 per cent fall. On the other hand, in the festive seasons of 2009 and 2010, the Auto index had outperformed the Sensex and rose 24.42 per cent and 21.08 per cent, respectively. The Sensex had risen 9.67 per cent in 2009 and 13.43 per cent in 2010 festive seasons. This year, the BSE Auto index has risen 16 per cent, driven by Tata Motors and Maruti. It was at 9,307 on September 6. Since March, even though the RBI has cut benchmark rates by 50 basis points, the increase in excise duty and fall in economic growth halted the index's strong run. Between 2 January and September 6, Tata Motors and Maruti Suzuki stocks jumped 26.80 per cent to Rs 233.05 and 26.37 per cent to Rs 1,183.85, respectively. Consumer sales pick up during August to December due to festivals. We expect stock markets to give better monthly returns this season. Experts are bullish on the sector for the next few months. Nishant Vass, research analyst, auto and auto ancillary, ICICI direct.com, says, "The second half of the calendar year should be much better as we get into the festive season. Easing of interest rates in the latter part of the year may also help. New product launches across categories, from passenger cars to two-wheelers to commercial vehicles, is expected to provide traction to the market." Kishor P Ostwal, CMD, CNI Research, says, "Two-wheelers will be the largest-selling category in the festive season as rising inflation and fuel costs create problems for the ordinary people." An investor can consider buying Maruti Suzuki and Tata Motors stocks. Maruti Suzuki posted net sales of Rs 10,529 crore in the first quarter of 2012-13 as against Rs 8,257 crore in the corresponding quarter a year ago. However, the net profit plunged 23 per cent to Rs 424 crore in June 2012 as against Rs 549 crore in June 2011. In August, volumes plummeted by 41 per cent YoY (34 per cent month-on-month) to 54,154 vehicles due to lockout at the company's plant in Manesar, Haryana. The worst seems to be behind for Maruti Suzuki India as the labour unrest seems to have settled down for now. 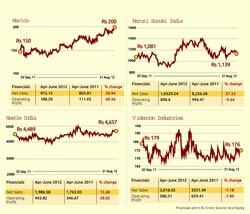 "There are better times ahead as Maruti ramps up volumes leading up to the festive season. Launch of the new Alto will also improve demand. Trading at an attractive valuation, we maintain our bullish stance on the stock with a target price of Rs 1,503," says Vass. On September 11, the stock was at Rs 1,214.